Every time senior Matt Coffman walks onto the field at Memorial Stadium and glances down at the "Indiana" written across the front of his uniform, he feels the same excitement he felt during his first game-day performance. 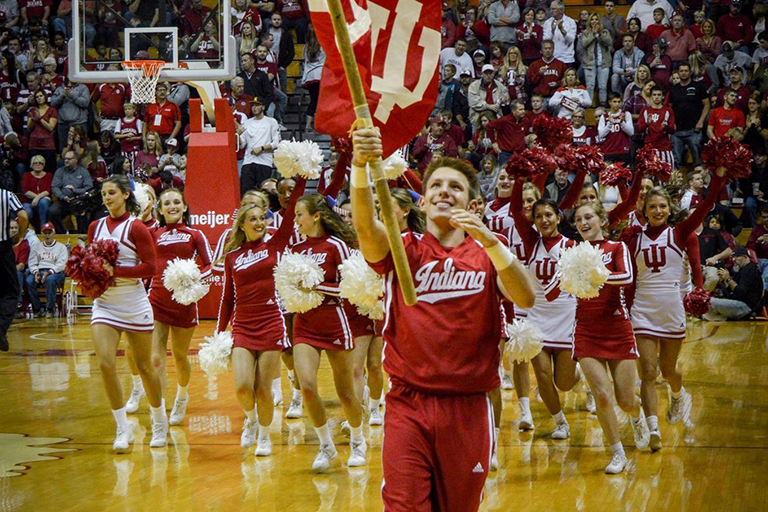 "The novelty never wears off," said the IU cheerleader. "When you put that uniform on, you get to represent your school, your home and the place that you love." This is Coffman's fourth year as a member of IU's Varsity Cream Co-ed Cheer Squad, and it is his 10th year cheerleading overall. Growing up in Naperville, Illinois, Coffman switched from gymnastics to competitive cheerleading before joining his high school's squad during his senior year. He planned to hang it up after high school, but, with some encouragement from his mom, he decided to try out for the IU squad. While not at all optimistic about his chances, Coffman walked out onto the court at Assembly Hall, with the coaches watching from the stands, and gave a stellar performance. 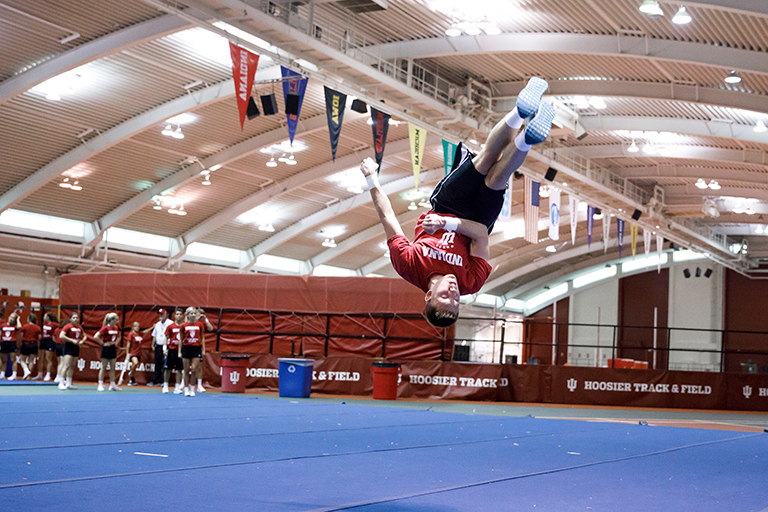 "The IU Cheer program is better by having had Matt the past four years," said Julie Horine, the squad's head coach. "Matt is a hard worker, has the ability to always see the big picture and is someone that I know I can count on to represent us anywhere. He truly embraces his role on and off the field." For the past four years, along with juggling a packed class load as an international studies major in the School of Global and International Studies with minors in human resources and Spanish, Coffman has spent his free time practicing stunts in Gladstein Fieldhouse; attending pep rallies and parades; and putting on a show for fans at every home football game. And he hasn't regretted a moment of it. "Athletics is a large part of IU's tradition," he said. "To be able to wear that uniform and say you are a part of that tradition is awesome." Coffman said that cheering in college has been different from his previous experiences with the sport. Unlike competition cheer, college cheerleading is centered on game day. The focus is on representing IU as an ambassador, he said. And for Coffman, that aspect is his favorite part. During his sophomore year, Coffman recognized how much he loves representing IU and being part of the school's biggest traditions, so he sought out a way to be more involved. That's when he discovered the IU Student Foundation, the student group that leads the planning of the annual Little 500 race. After seeing what the organization was about and the opportunities he would have, Coffman decided to sign up for "gunning," the process a junior goes through to be selected for the Steering Committee during their senior year. While anyone can join the IU Student Foundation, the Steering Committee is its leading body. 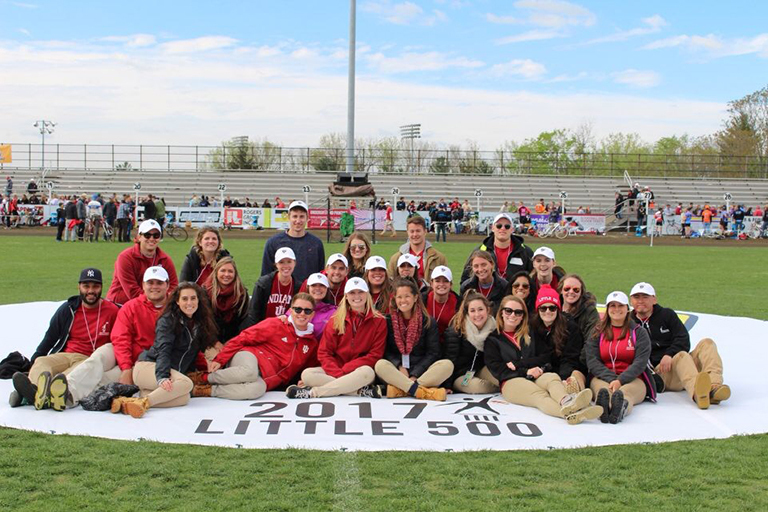 Those 25 select individuals are responsible for overseeing the scholarship process, committees and events like the Little 500. At the end of the "gunning" process, Coffman was selected to serve on the Steering Committee for his senior year. "Cheer brings me so much joy, and it's something I've been involved with for so long, but IUSF is the other half of my heart," he said. "It's a different sense of involvement, but I'm still contributing to one of the university's biggest traditions." Coffman, who hopes to pursue a career in human resources for a government agency after graduation, puts what he is learning in the classroom to use as head of recruiting and retention for the student organization. Tara Vickers, the student foundation director and Coffman's advisor, said he is the perfect fit for the organization's membership role. "Matt's outgoing, warm and welcoming demeanor are absolutely perfect for this," Vickers said. "He approaches his work at IUSF with dedication, integrity and a great sense of humor. His positivity is infectious, and he is such a natural leader." One evening last year, as he was helping to prep for the 2017 race, Coffman watched a rider complete a perfect exchange, the joy visible on his face. He said that moment perfectly captured why he chose to be involved with the group. "Being an ambassador of the university in any sense feels like you're giving something back to the university and to all the people here who make your opportunities possible," Coffman said. "To me, that is a great way to spend your time here." No matter what he does or where he goes next, Coffman said there's one thing he knows to be true: He will always want to come back home to IU.